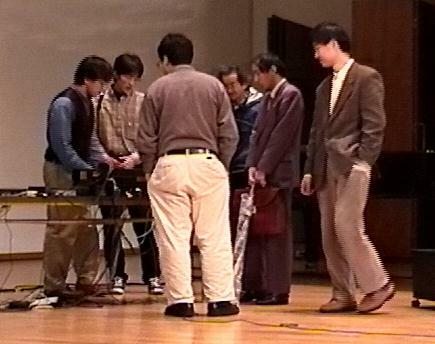 1999.3.20 Concert in Souai Univ. 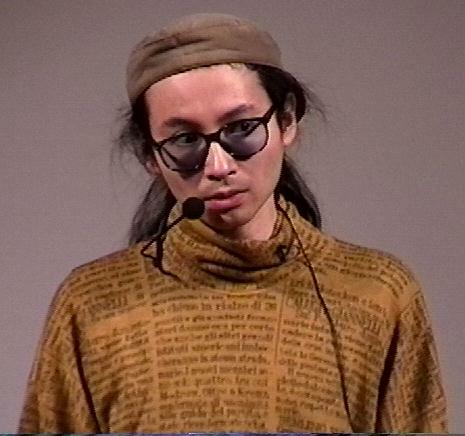 Yoichi Nagashima : "bit extra issue"
Yoichi Nagashima : "Arrow of Time"
Kazuya Ishigami + Osamu Usami : "Comprovisation #2"
Yasushi Yoshida : "Colors of the Sound"
Hisashi Okamoto : "Area of Light for Limber-Row"
Yoichi Nagashima : "Voices of Time"
This is the main hall of Souai University. 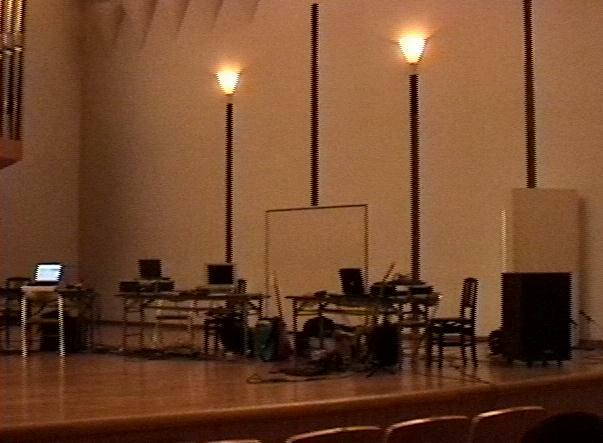 Stage setting of main mixer, CD player, Video Player, and my system. Capybara-66 is on the desk. 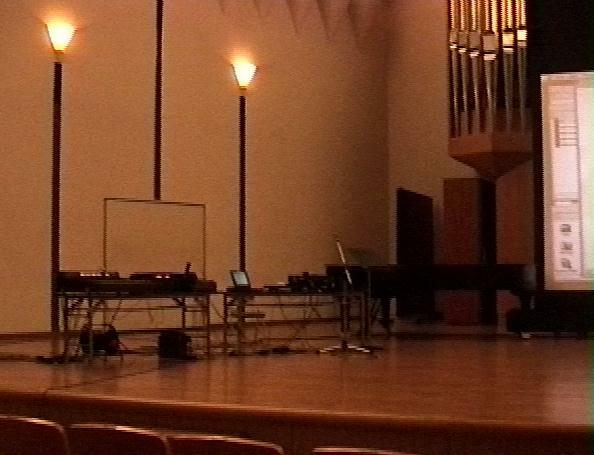 Stage setting of other composers. Capybara-320 is under the desk. At the beginnig of this workshop, I have a lecture. 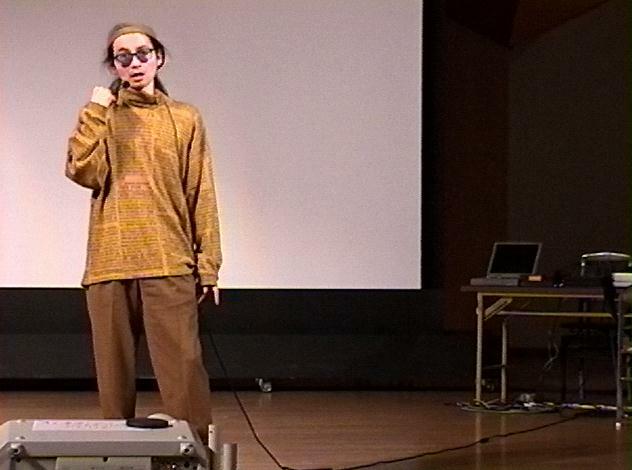 I reported ICMC1998 Michigan, and some softwares (MSP, Kyma, SuperCollider) with demonstrations. 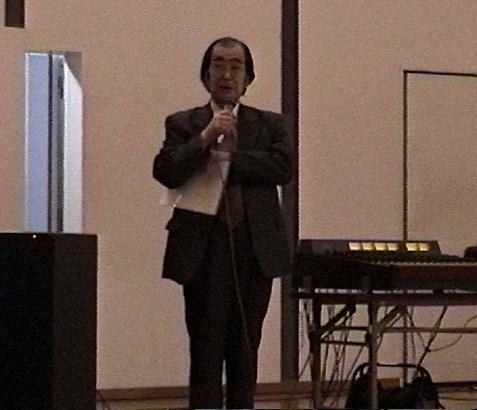 Professor Eisei Tsujii, composer, Laboratory of Music. 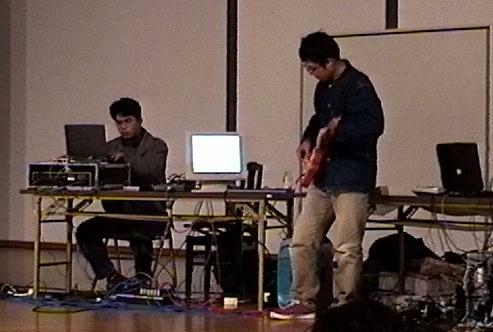 2 years ago, I requested him to record some contemporary performance sounds as sound materials for my composition. 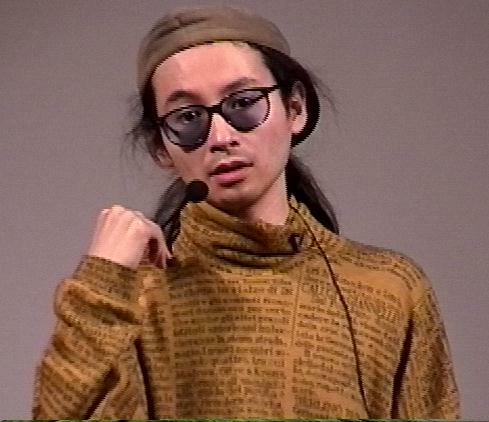 He did not make a tape with sample sounds, but sent me a DAT with perfectly composerd/performed new piece of himself. 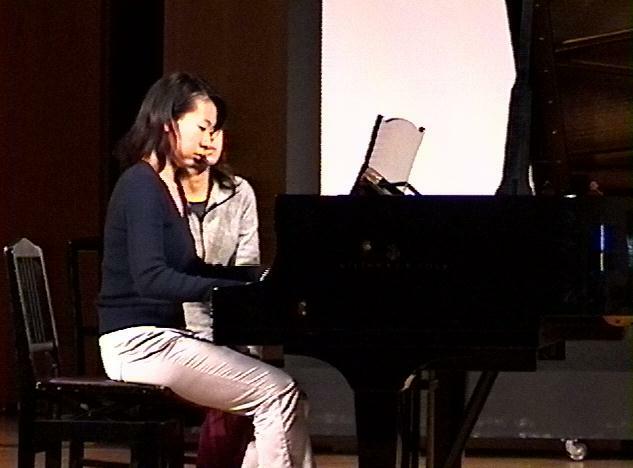 The first piece of this concert is thid work "EPSIA" performed by Satoko Ohta who played the piece for premiere 2 years ago. She is Satoko Ohta. Very cute performer! 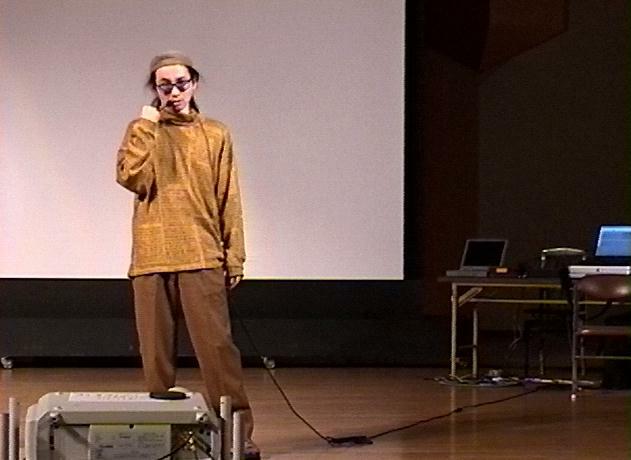 She graduated Souai University, and now she studies at master course of Showa Music Collage. 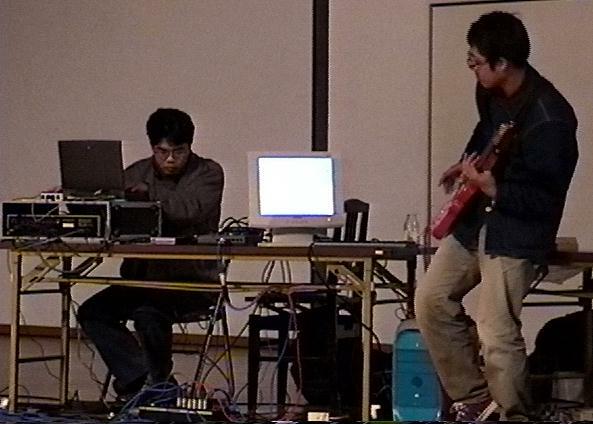 This is live recording of "EPSIA" with 22.05KHz MP3. I composed next 2 pieces only from this sounds as materials, and I never use other sounds. 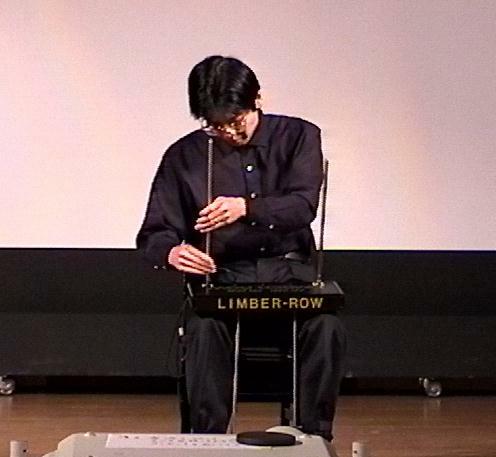 2 years ago I composed 3 pieces only with sound materials of "EPSIA", and this piece(tape music) is newly composed as re-mix version of these 3 works in 1998. 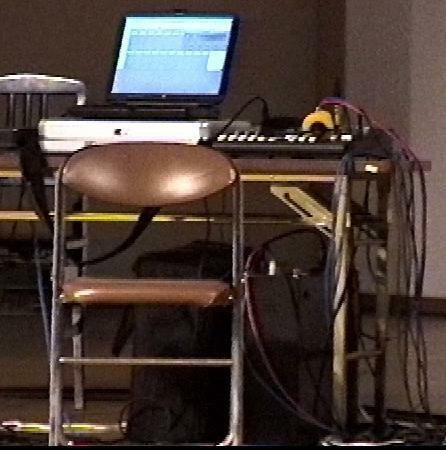 This photo is well-known "stage of tape music" (^_^;). This is "bit extra issue" with 22.05KHz MP3. 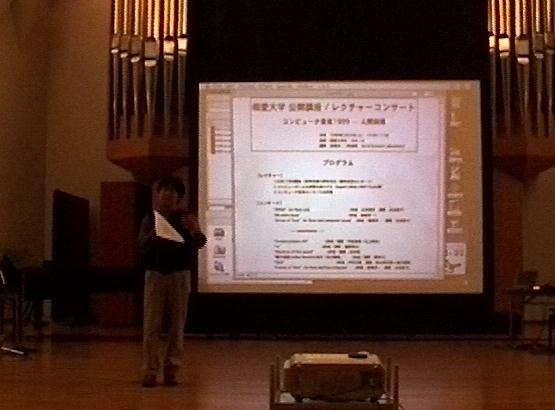 All sounds are generated by SGI Indy with SGI soundeditor, and my original signal precessing softwares. I only use techniques : loop, pan, reverse, mix, and pitch change(with speed change). 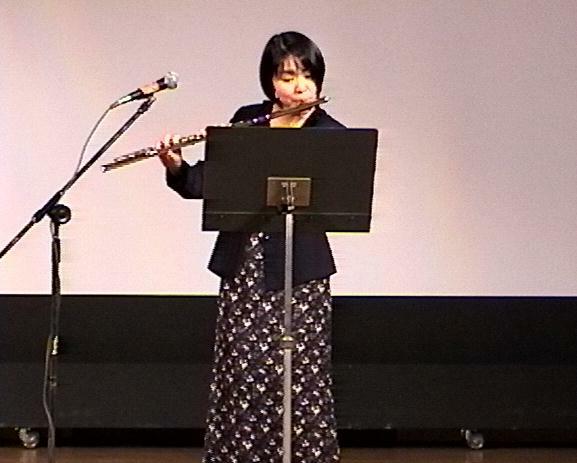 This piece "Arrow of Time" is composed for Satoko Ohta. I use only just same sound materials (DAT) of 2 years ago, and I pre-processed with Indy and Kyma them, finally produced "back-grounded" CD part. 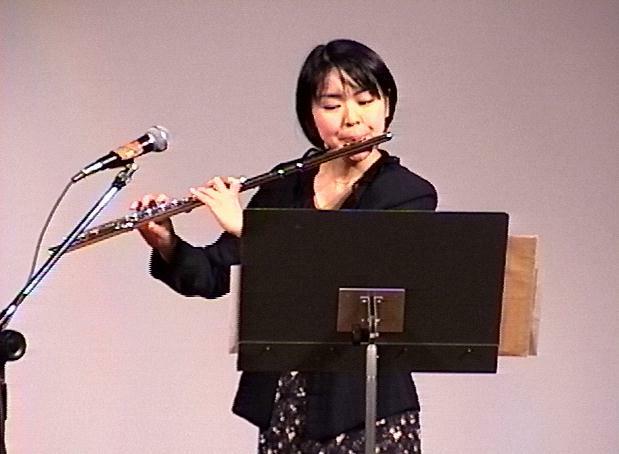 The performer, Satoko Ohta, listens to the BGM part, and plays with fully improvisation. I write a score, but there are some "available note for this scene".... She must generate the rhithm, scale, phrases at the performance. And she just plays best !! 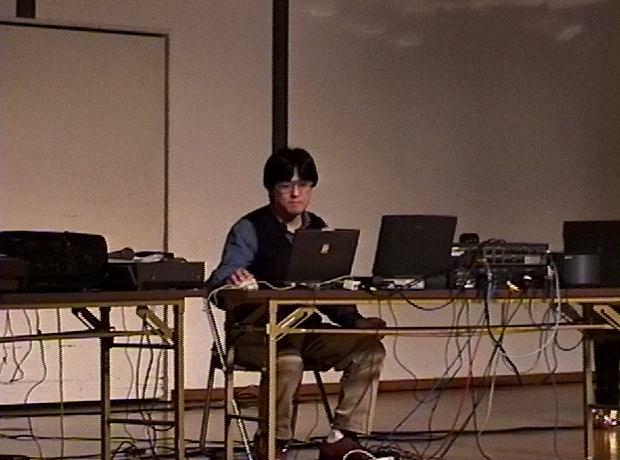 This is live recording of "Arrow of Time" with 22.05KHz MP3. All BGM-CD sound are generated by Indy and Kyma, and flute sound performed by Satoko Ohta is not effected, only amplified for the balance with CD part. 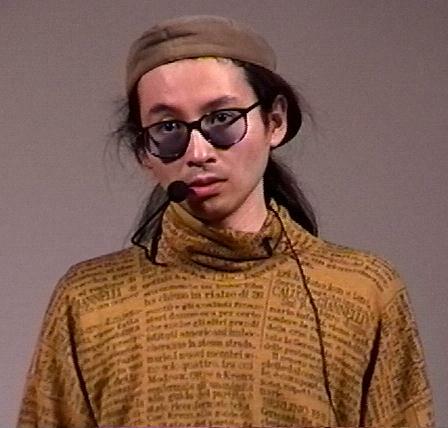 This piece is collaborative work by Kazuya Ishigami(left) + Osamu Usami(right). 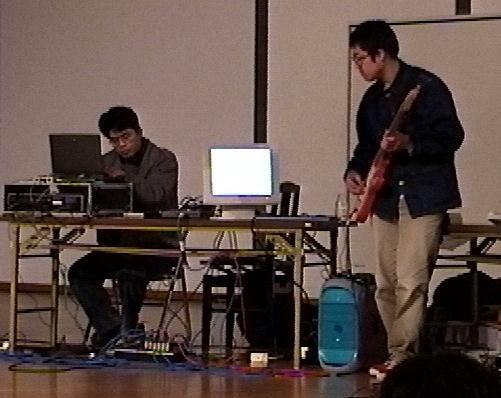 Kazuya Ishigami(left) plays sampler with MAX and generate noise part, and Osamu Usami(right) plays the guitar to generate noises which is live-effected by "SuperCollider" on G3Mac. They play with improvisation, but I felt the structure of music. 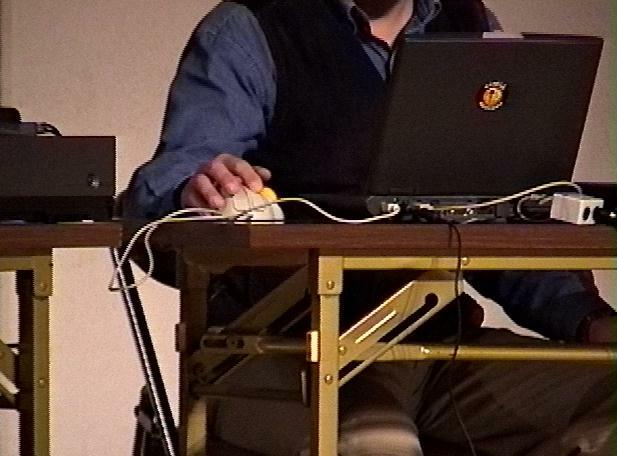 He plays the guitar with MOUSE of G3Mac running SuperCollider, so the position information changes the sound effect parameters in real-time. This is short part of the sound clip of the live recording with 22.05KHz MP3. If you want to listen to whole the work, please contact them. She is only one composer of student of Souai University. 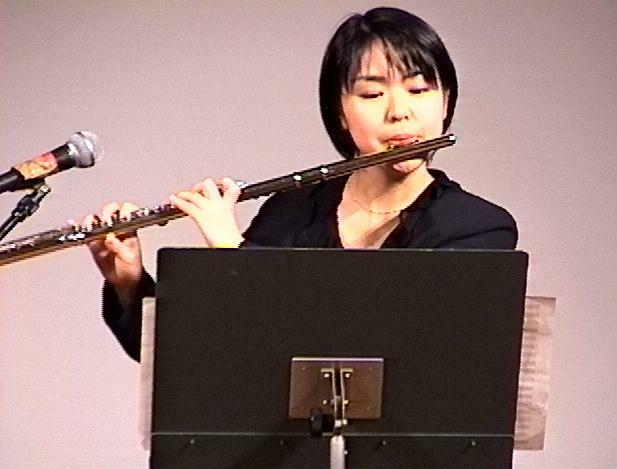 She plays her original piece. 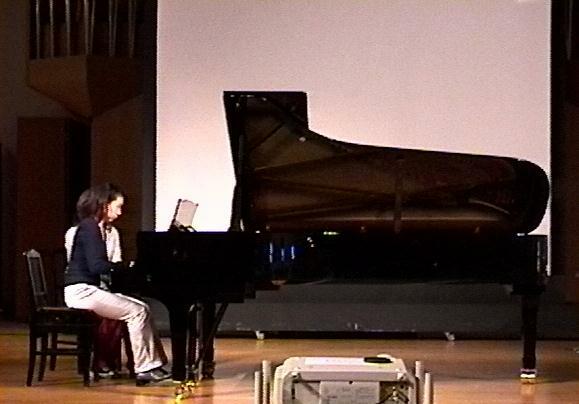 This piece is the style of minimal music, and pure acoustic. I just like this music of 5-beats. Very good! 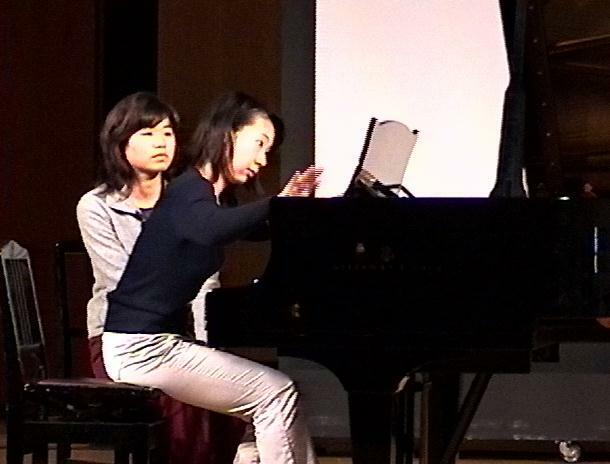 At some scene, she plays with striking the body of piano. It's natural and exciting. 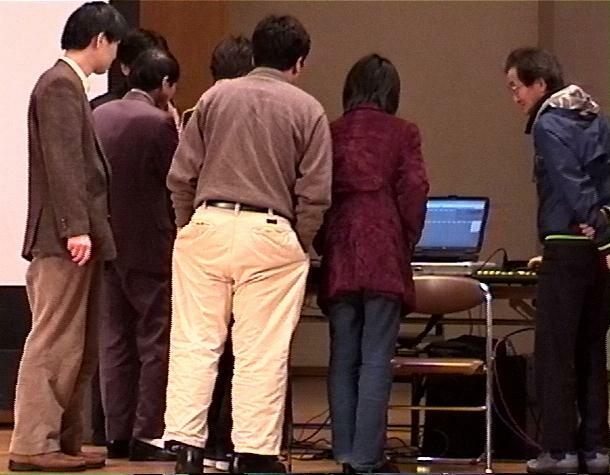 This is short part of the sound clip of the live recording with 22.05KHz MP3. If you want to listen to whole the work, please contact her. 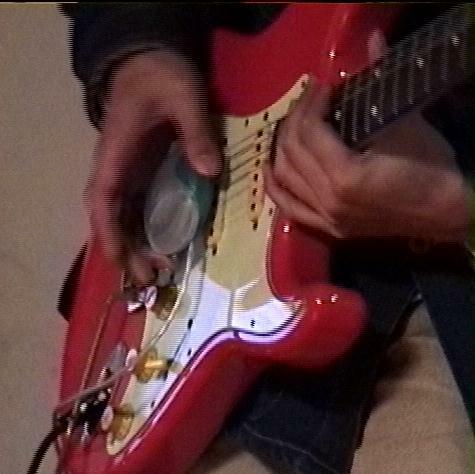 He plays the guitar, but he only performs as a vocal without a guitar. 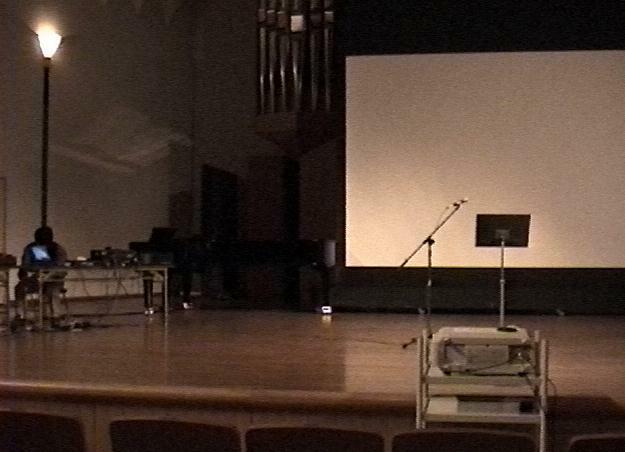 He stands in the center of stage, and sings improvisely. He uses Kyma with Capybara-320 !!! The system is very powerful. 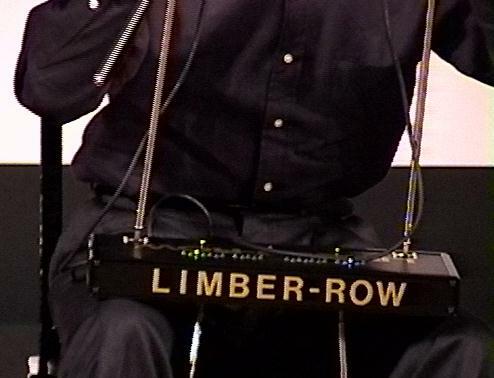 I this piece, he only performs with microphone, without any sensors. The patch of signal processing is pre-composed in Kyma, and these patches are sequenced by time control objects. His voice, processed his voices and sampled female voices makes fantastic harmony in this piece. 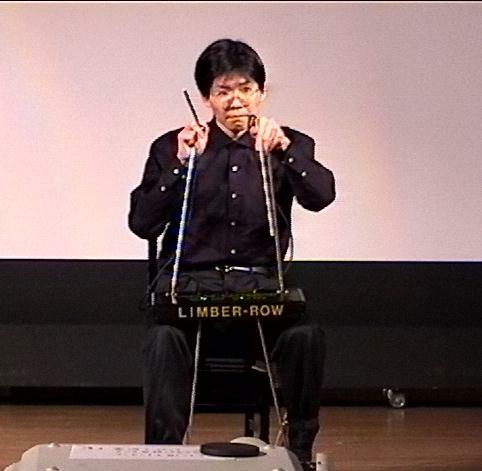 He is setting the original instrument "Limber-Row" at the beginning of the performance. He playes with moving both arms, both grips and both legs. This machine generates MIDI information, and triggers GM sound module. 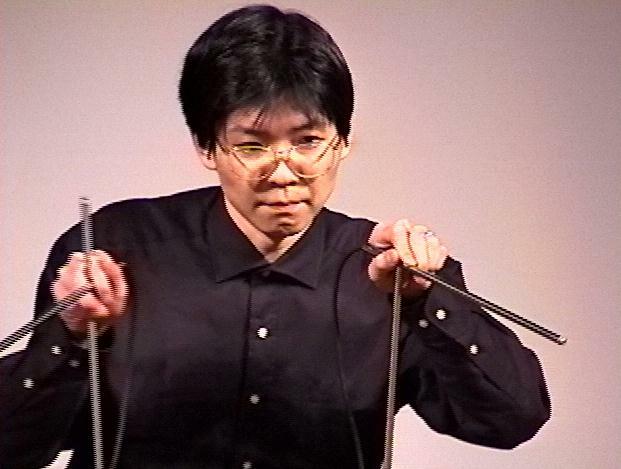 He controls the angles of the sticks, and beats in the air for triggers. 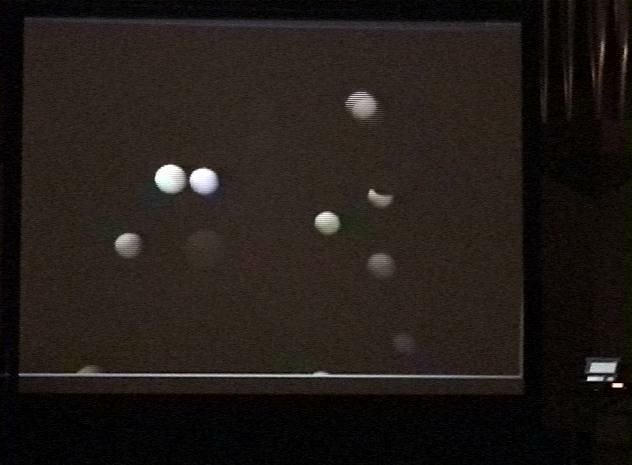 This work is multi-media art with computer music and computer graphics. The real-time CG program is written by the composer with Open-GL for the Wndows computer. 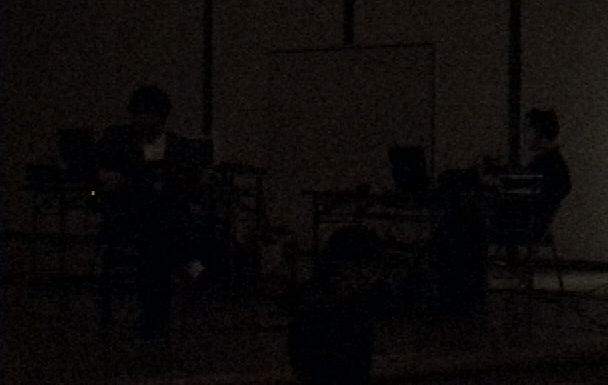 The stage is very dark sorry, but they are guitarist and keyboard performer. 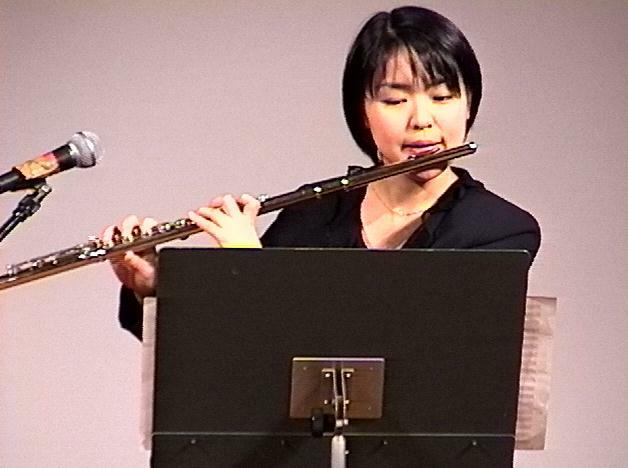 This piece is live computer music for flute solo and live computer system with Kyma. There is no CD or fixed part in this work, the sound of flute solo is live sampled and live processed by Kyma. I control Macintosh to trigger for sampling/control with MAX. The MAX output MIDI controls Kyma parameters in real-time. This is my style of composition now. 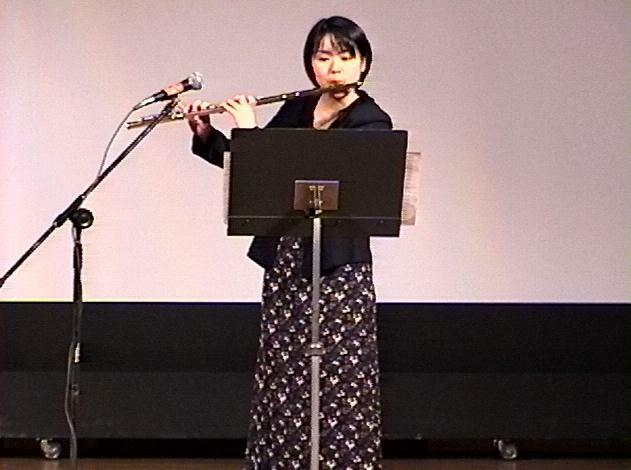 Flute performance is perfectly and improvisely played by Satoko Ohta. 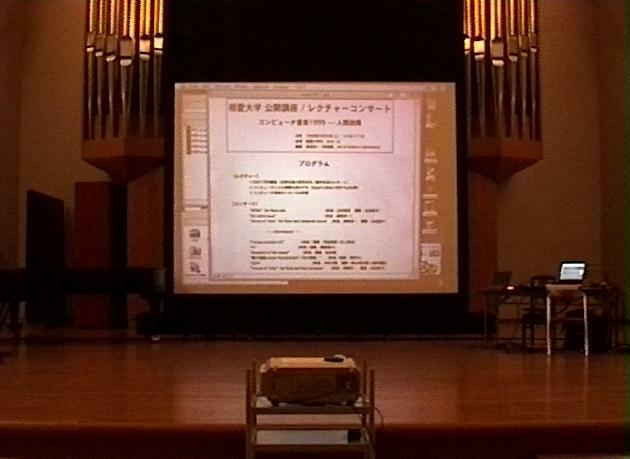 This is live recording of "Voices of Time" with 22.05KHz MP3. 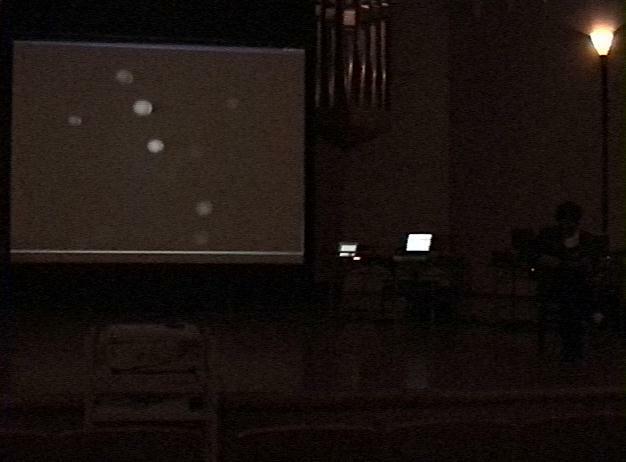 All sounds are generated in real time. 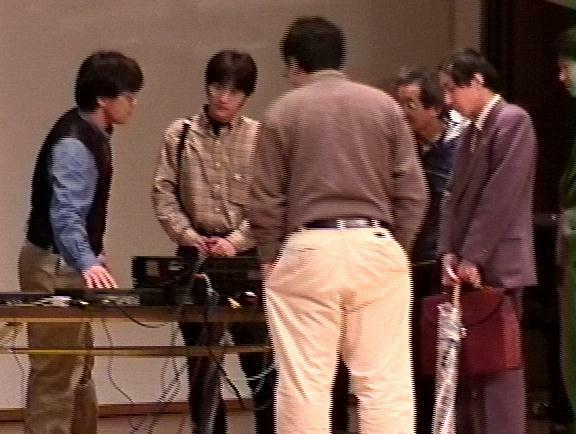 After the concert, audiences gathered on the stage to check systems.